Are you a lad, a legend or a lover? You’re allowed to be all three at House of Holland. We chat with Henry Holland about his lad obsession. As Henry Holland’s first foray into menswear, you’d be forgiven for thinking he might dip a toe into the water rather than plunge in head first. But, of course, that isn’t the House of Holland way. Hosted by exclusive stockist of the collection, Selfridges, Henry tried his hand at everything in his presentation, from denim to outerwear, footie strips, outerwear and accessories. He didn’t do it quietly either, in acid neons, primary colours and shine materials all stamped with eye-crossing prints in clashing colours. If you’re thinking of topknots and “Cheeky Nandos” when you hear to world lad, stop. Henry looked back at all the highlights of the 90s rave culture he grew up in, when the Stone Roses ruled and British football was a dirtier, grittier affair. Other than quite literally scrawling “Lad” over everything, other highlights include the thick set leather jackets and aubergine “Lover” football shirt. 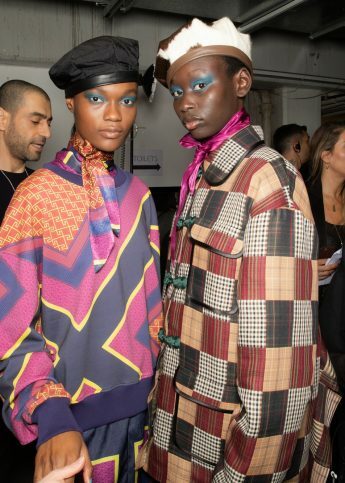 Before the power cut for a dramatic ending to House of Holland’s first menswear presentation, we cornered Henry himself to talk about the collection. The inspiration, was it the love of lads lads lads? What kind of music do you listen to in the studio? The Stone Roses, Chemical Brothers, Charlatans. The ultimate lads. We started off doing like a clubby stuff but that was what the girls were listening to. The lads were listening to all of this and then the girls wanted to shag the lads that were listening to this. Why have you decided to go to menswear now? I think for two reasons: one because the menswear market is so exciting, so much more exciting than it was a few years ago. LCM is an amazing event and the contemporary men’s market has become really exciting in the last three years I’d say. Who has excited you the most? There’s loads of brands that have all come up quite simultaneously. Sportswear brands like Pigalle and Gosha Rubchinskiy, MSGM and what Kenzo have done. It’s a whole contemporary world. And the collection is going immediately into Selfridges? The collection is in Selfridges, it goes on the shop floor tomorrow and it goes online right now. It went online at five o’clock, we’ve already sold stuff. So we can already see what we’re selling while the show is happening which is weird, but amazing. Why did you want to do that straight away? Because I just think that’s the way it’s going. It’s so frustrating to put on shows and not be able to monetise and utilise all the attraction you get on social media or traditional media. Also, I think from a menswear point of view, men and lads aren’t really into fashion in the way they see something on the catwalk and then wait for it for three months. Guys are so much more fashionable now and they’re really into it, but they see something and they want it, so it’s giving them that opportunity. What’s your favourite thing in the collection? The denim jacket with the neon!